Catching Illegal Contracting in the Act with "Eyes on Site"
Anyone who plans to become a licensed contractor can benefit from a recent CSLB webcast that clarifies the experience verification process that all applicants must undergo to qualify for a license. The two-and-a-half-hour session, recorded at CSLB's Sacramento Headquarters in December, reviewed acceptable types of experience and the most efficient ways to document work that supports an applicant's claimed journey-level experience. Better understanding of the experience verification process enables CSLB Licensing staff and licensing schools to work together to help applicants streamline their application process and begin their careers. The Licensing division also has added staff to assist with the verification process. 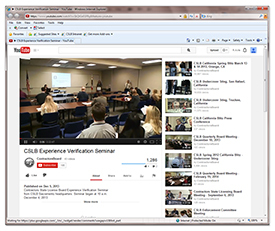 The experience verification presentation is available on CSLB's YouTube page.